The introduction of smartphones has created plenty of opportunity for businesses. Smart Insights shows us that the number of people using mobile exceeded desktop by almost 200,000 between 2014 and 2015. Over the last five years, we have seen mobile become the primary channel that customers use to connect to their favorite brands. 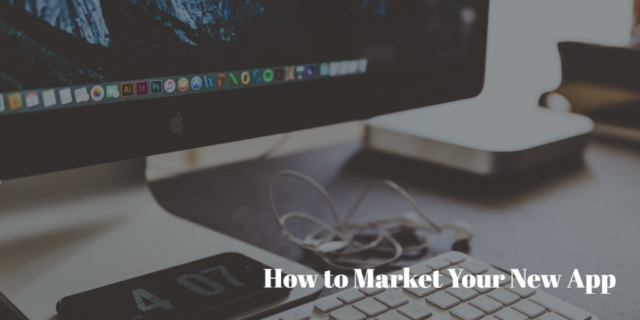 Here are tips on how to market your new app. If you are reading this, marketing an app is unchartered territory. Setting goals are not. You can set goals similar to any other marketing campaign. When you set goals, make them specific, measurable and attainable. There will be individual differences that you must consider when marketing an app. App store rankings, organic and loyal user acquisition, cost-per-download, and app store optimization are just some of the areas you will have to focus on. Concentrate on the KPIs specific to app marketing. This will be unfamiliar ground. It’s recommended that you have a dedicated team to focus on the KPIs specific to apps. It’s important to understand how the goals you have set will benefit your app. Specific app marketing goals can be in line with other marketing strategies if they remain focused on KPIs unique to app marketing. Advertising, marketing, and mobile marketing are not the same things. Don’t get them mixed up. Mobile marketing requires a different set of expertise and technology. Digital marketers aren’t always knowledgeable in the field as well. Partnering your mobile marketing with your in-house team or agency is recommended, this combines and aligns all marketing strategy. Combining groups will help with challenges such as app usage analytics, targeted media buying and reaching optimal ranks. The more downloads, the better. You have a greater chance of ranking in the app store with more downloads. However, organic users are not considered to be the most valuable. Loyal users are the ones that turn a download into ROI from actually using all the apps features. It’s common for individuals to download an app, use it once and move on. If you are not getting users that are staying and frequently using your app, there could be problems with design and functionality. Without fixing these issues with your app, you won’t be able to take full advantage of your organic lifting and campaigns to boost downloads. Loyal users, at the end of the day, are going to determine the success and future of the mobile app side to your business. Previously, companies made apps for the sake of having one for customers. Companies would market the app itself. Now, you are trying to sell the experience the app provides. You are marketing how the experience your app provides is superior to competing apps or experiences they have encountered. This would apply to an individual who is marketing a new app as well. Consumers don’t want to be confused or overwhelmed by too much information. Customers look for a simple and straight forward experience. You should keep this in mind when you are writing descriptions and titles. So, what do you market specifically? Market how the app will make the user’s life easier. Customer experience is now at the forefront of marketing strategy. Focus on the experience. If you are facing indecision about creating a new app, ask yourself if your brand can offer a great experience? For example, companies like Outbax Camping provide a great experience selling quality camping products online. They must consider creating an app; they can market a similar great experience they offer on the app. Marketing your app is an ongoing job. The mobile app environment is dynamic and always changing. Whether it’s you or a marketing team, always be planning for the future. New updates, changes, building awareness, retaining users and gaining engagement is something that will never stop. Marketing an app is about moving past the idea of just having one for the sake of it. It’s more about the understanding the impact they can have on the progression of a brand, its awareness, and increasing revenue and traffic. The best app marketers are always going to be the ones who dedicate the time and effort.